Finding cute shorts that are long enough is a battle every year. 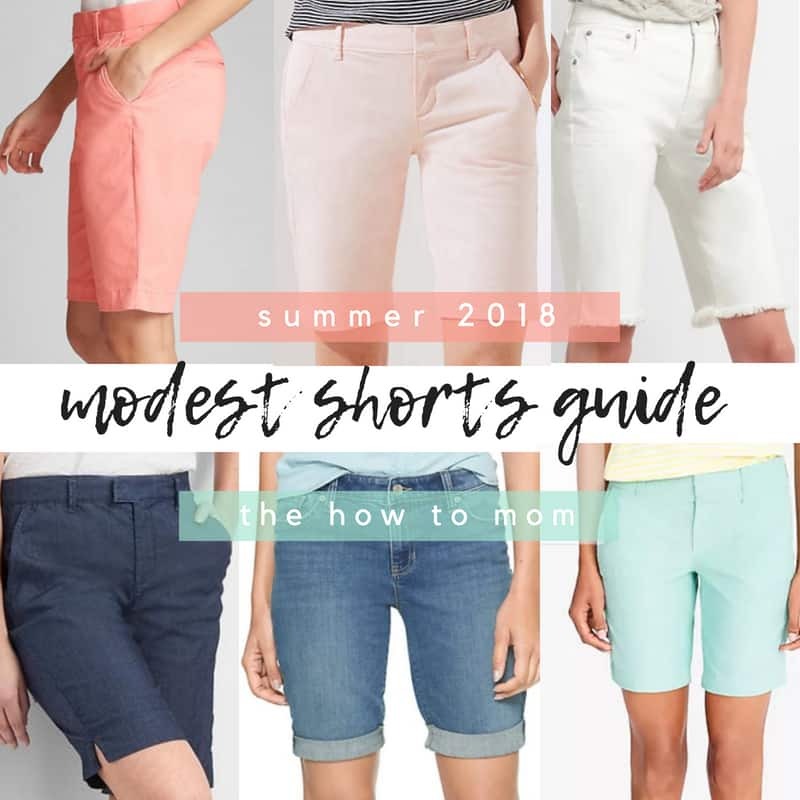 I’ve sorted through pages and pages of terrible, ugly, frumpy mom shorts to bring you this shopping guide to on-trend, fitted, easy to wear modest shorts. Here in Charleston, SC, we are pretty much wearing shorts from March to November! My wardrobe has a jeans to shorts ratio of like 1:6. So, I’ve spent a lot of time trying to find cute pairs, and how to wear them so I feel like I look good. I’ve always got an eye out for them when I’m shopping, and thought I’d share my finds with you! Many of these modest shorts are in my summer capsule wardrobe and also this casual summer outfit post too. This post contains affiliate links. I may receive a commission if you choose to purchase. I personally own a few of the pairs I have linked up in the images below, specifically the J.Crew twill bermuda shorts (cough, 5 pairs, cough-cough), I’ve been wearing them for probably 5 or 6 years now. Each year they stock different colors, so hopefully they’ll add some fun colors as summer approaches. I also really like the cuffed denim bermudas that I’ve found at Gap Factory Outlet. 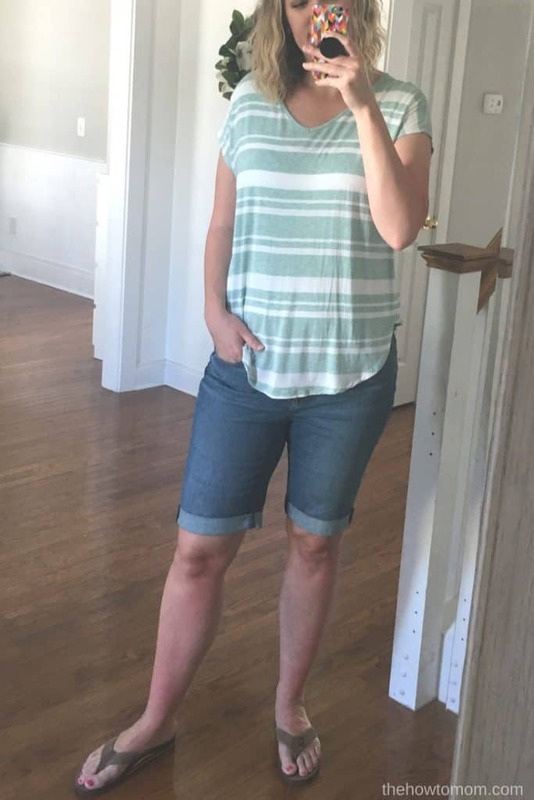 This year I found some denim bermuda shorts with a cuff at the Loft Outlet (pictured above), and I like them even better than the Gap pair, because they’re not as tapered at the knee. My legs are …”muscular” even though I don’t exercise… haha. Unfortunately, Loft Outlet doesn’t have a website yet, so… go check out your nearest outlets. They’re called “bicycle denim shorts” and they’re fairly stretchy and long enough and cute! The top is from there as well. The bermuda shorts shown below are all at least a 9″ inseam, which should be long enough for most of us. I’ve seen a lot of cut-off style bermudas this year, so that is definitely an option too. Grab a pair of distressed boyfriend jeans and cut them off a bit above the knee! I’m working on a bunch of other modest summer outfit posts (the struggle to look cute and not melt is real!). Last month I shared my favorite breezy modest summer dresses, and I’ve got a post coming up about cute and modest summer lounge wear. 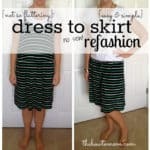 You can check out last year’s summer capsule wardrobe too. Hopefully I’ll get this year’s done soon! Check back here or follow me on IG or The How To Mom on FB! « How to Make a Hydrangea Wreath – Easy!